Winner of 'Best of Haymarket 2016' & 'Best of Haymarket 2017' in Haymarket Lifestyle Magazine! 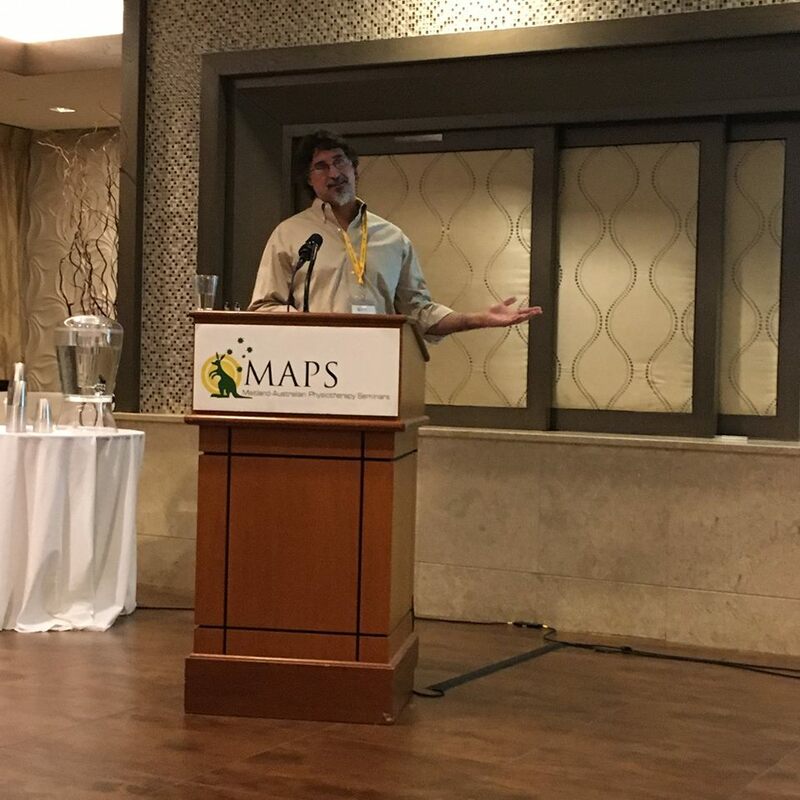 Dr. David Sahley teaching at the 2016 M.A.P.S. Symposium in New York. 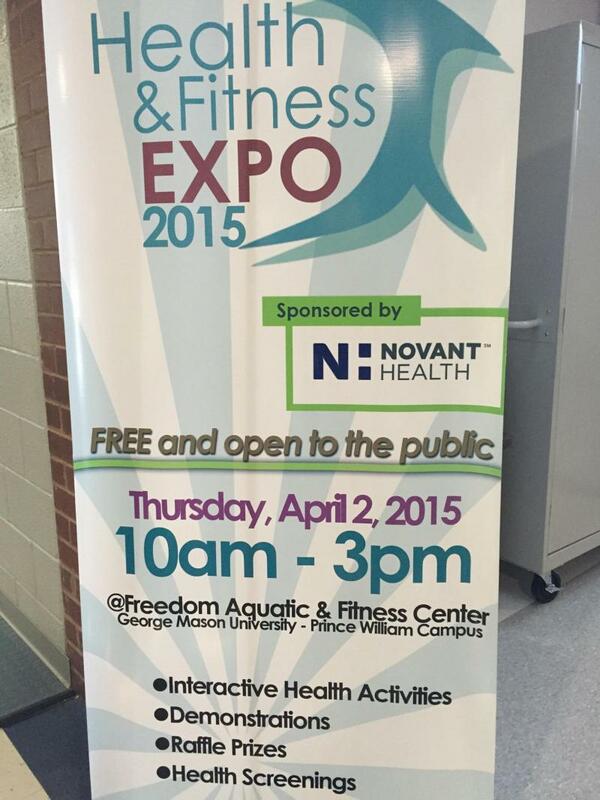 *Thank you to all who came to the 2016 Spring Into Health Fair! Boys and Girls Club of Greater Washington- Hylton Branch. 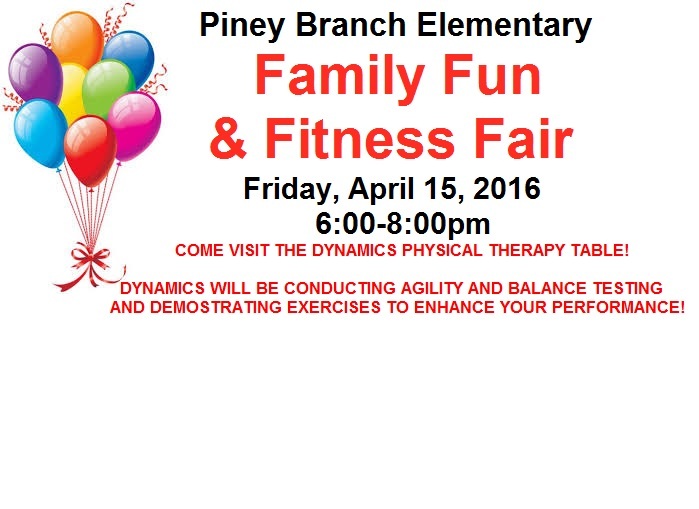 For more information visit: springintohealthfair.com. 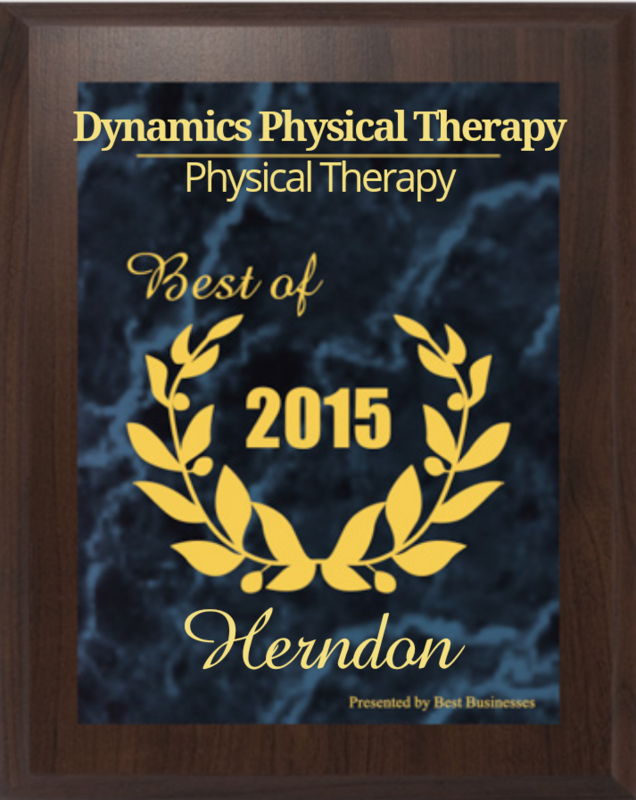 by the Best Businesses of Herndon Award Program. Dynamics Physical Therapy will be conducting a food/toiletry drive in our Haymarket & Gainesville offices. Please visit, haymarketfoodpantry.org, if you would like to learn more on how you can help. 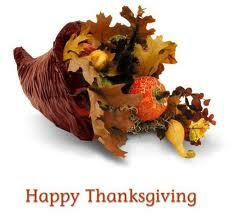 THANK YOU FOR YOUR GIFT OF GIVING! 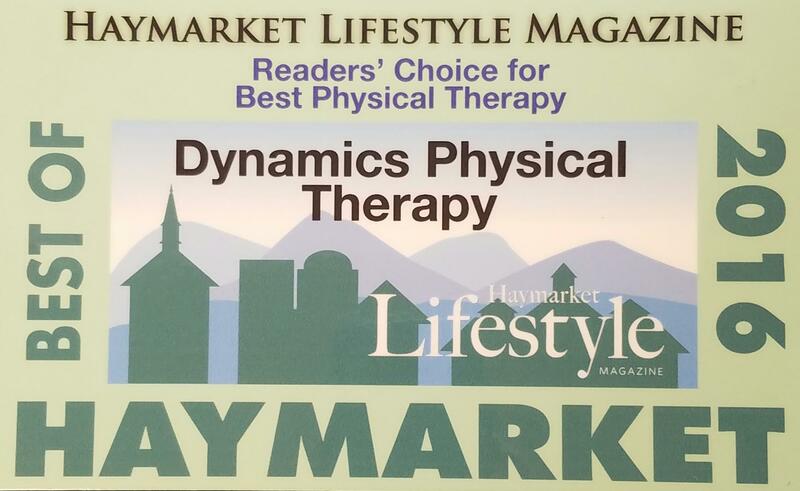 We are happy to announce that Dynamics Physical Therapy has received honorable mention for BEST PHYSICAL THERAPY in Haymarket Lifestyle Magazine 2015. Come visit Dynamics Physical Therapy at the 2015 Haymarket Day, taking place in Haymarket on September 19th from 9-4! in the Herndon Golds Gym on July 29th at 6:30 PM! 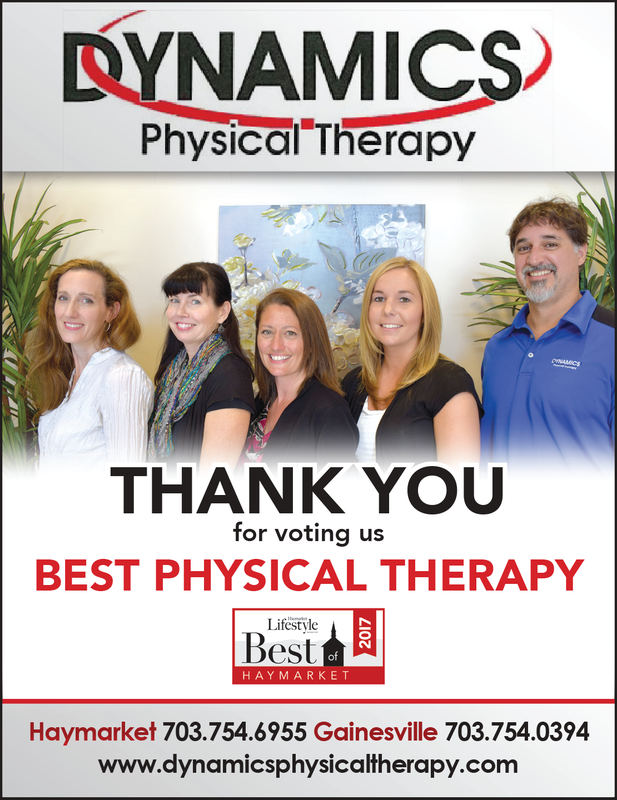 We are very proud and excited to announce, Dynamics Physical Therapy has been helping patients return to their quality of life in our Herndon location for OVER 10 YEARS! Over these past 10 years we have strived to give all our patients the best care possible. We couldn't have done it without you. For more information, read the article, here. Dr. David Sahley will be teaching a course for Maitland Australian Physiotherapy Seminars in Vienna, Virginia next weekend- April 17-19th, 2015. For more information on this course, and how to register to attend, click here. Dynamics Physical Therapy enjoyed meeting everyone who came out to the Spring Into Health Fair at the Boys and Girls Club of Greater Washington- Hylton Brach this past Saturday! Dr. David Sahley at the Micron Health and Wellness Fair on March 17th. "This FREE to attend health fair is a great oppurtunity to check in on your health and ask questions of professionals in a no-pressure environment"
We are excited to participate in another Micron Health and Wellness Fair, on March 17th and 18th, as a preferred Blue Cross provider for employees! please read this months N.R.A.F.E. Newsletter! Free Back Screening and a Free Memory Foam Pillow. Contact our office to Sign-up! please contact your local office for specific details. Stay healthy while clearing the snow! Click above for useful tips to help us as we encounter our first snow of 2015! Dr Joanne Balint was featured in the months edition of Your Health Magazine, Meet Your Local Health Professionals. Her article on Concussions and Vestibular Therapy can found at yourhealthmagazine.net or by clicking the icon below. 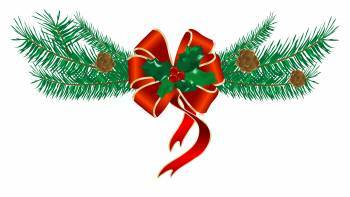 Check out Dynamics' new, animated e-card for the Holidays! Congratulations, Dr. Karen Jensen-Vick, DPT, COMT. Dr. Jensen-Vick has recently became a Certified Orthopedic Manual Therapist after completing her training through the Maitland Australian Physiotherapy Seminars. She will be our second COMT based out of our Herndon location. Scheduling appointments around the Holidays can be difficult. At Dynamics, we have adjusted our schedule to help accomidate yours. 8am-1pm on New Years Eve. Last Thursday, many members gathered to say farewell to this beautiful organization. Dr. David Sahley, the owner of Dynamics, was a Vice President of this charity. teaching in Washington, DC November 7th-9th!